There is no room in Ibiza for boredom and we all know that holidays are always remembered for their great moments. 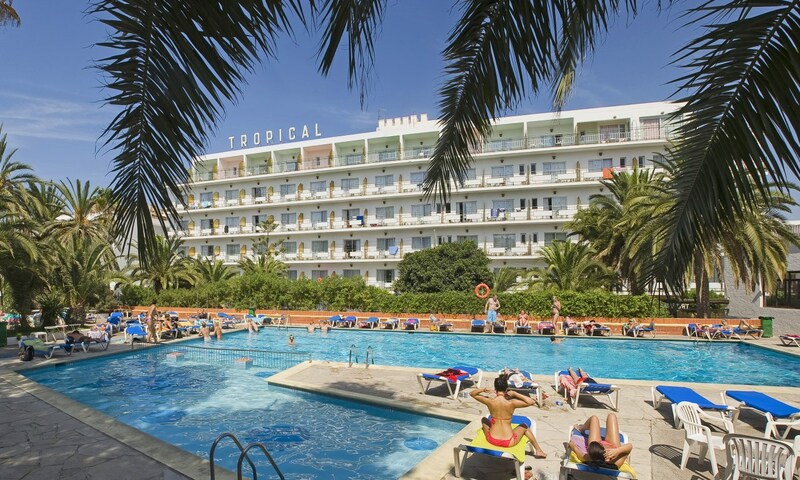 If you are looking for a central, clean and great value for money hotel, where highlights our customer oriented staff in a chilled and friendly atmosphere, the Tropical Hotel is the perfect choice for your trip to the white island. 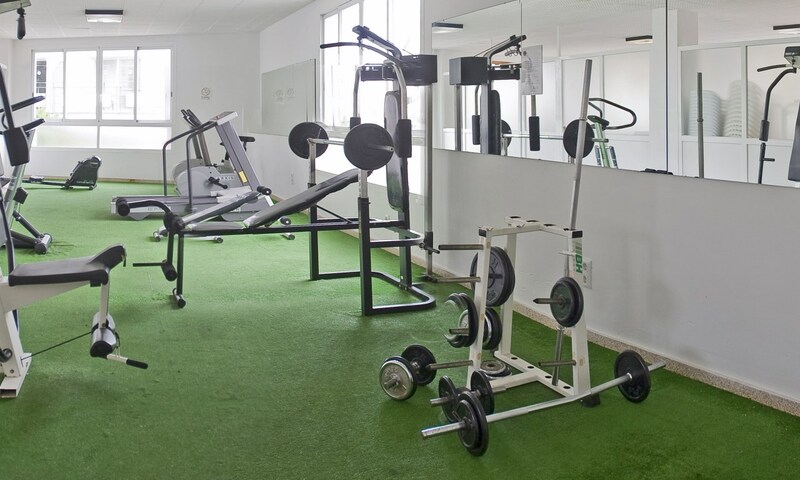 Our ideal location in the center of San Antonio just five minutes walk away from the main attractions and transport, as well as one of the most beautiful shows that the nature offers, our famous sunset . You will find plenty of bars, pubs, terraces, beach clubs and discos where the crowd gather every day to enjoy, have fun and spice up the night. 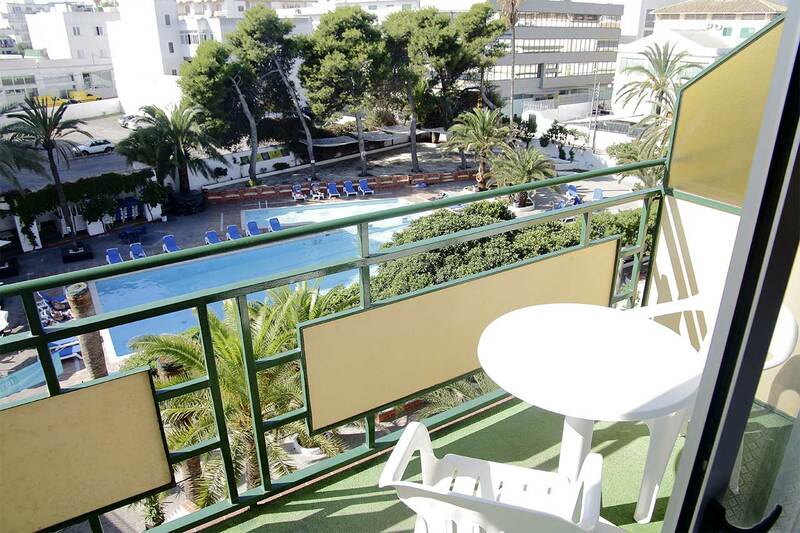 We have 142 standard rooms, 70 of them with balconies. All of them equipped with air conditioning, free Wi-Fi and international satellite TV among others to make your stay with us as pleasant as possible. A wide "chill" pool area equipped with snack bar, fitness room, free Wi-Fi in rooms and common areas, buffet restaurant serving breakfast and dinner, 24 hour reception and luggage storage are just a few of the many services and facilities this centrally located 3-star hotel has to make your stay in Ibiza unforgettable. Hotel especially recommended for young people, couples and groups. Whether to celebrate the best stag/hen party of your life surrounded by friends, your birthday party, the anniversary of that special date, meet people of your age in a friendly atmosphere or just enjoy the beginning of the summer holidays after a hard year of study, the Tropical Hotel is the place you are looking for to stay in Ibiza and enjoy all the delights the white island has for you. Your Hotel in San Antonio at the best price! 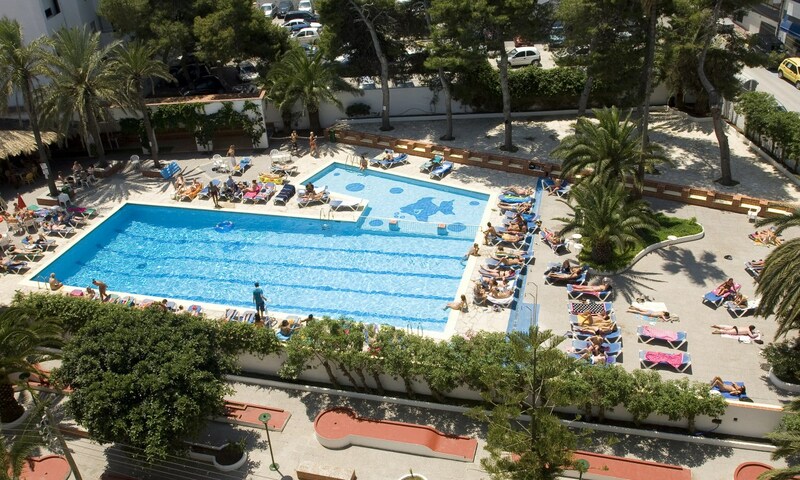 The Tropical Hotel offers 142 rooms, 70 of them with balconies oriented to the hotel pool area. All our single rooms are without balcony. Most of our rooms for 2 people are equipped with single adjoining beds, although we also have some with double bed that can be allocated on request, always subject to availability. Guests can check-in after 1.00 p.m. on the day of arrival and check-out before 11.00 am on departure day. If you want to request an early check-in or a late check-out, you can do it via the contact form (subject to availability at the time of arrival or departure with an extra charge). One of the main goals the Tropical Hotel team has is to improve year after year the service and facilities standards offered to those who know us best: OUR CLIENTS. 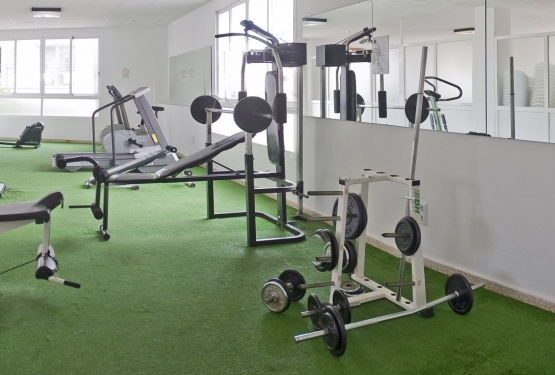 The Tropical Hotel stands out not only for its professional and friendly customer service but also for its quality. Our buffet restaurant located on the ground floor offers a full breakfast buffet (continental and english) and dinner. We know your needs and we know that after a long night in Ibiza more than one will be too lazy to wake up early to have breakfast, which is why we offer a wide opening time, from 8.00 a.m. to 11.30 a.m. Dinner buffet is served from 08.00 p.m. to 10.00 p.m. (drinks not included in dinner). 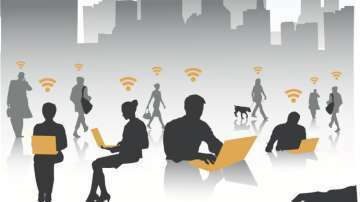 What is the hotel policy on noise and anti-social behavior in the rooms? 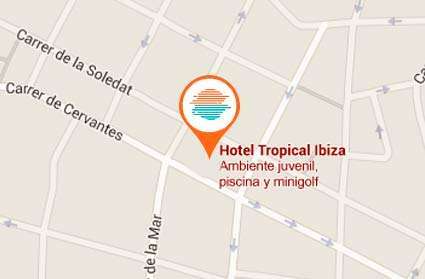 One of the commitments of the Hotel Tropical is to ensure your rest, specially by night. We are close to the nightlife area but far enough away for those who want to enjoy their rest can do it without any problem. 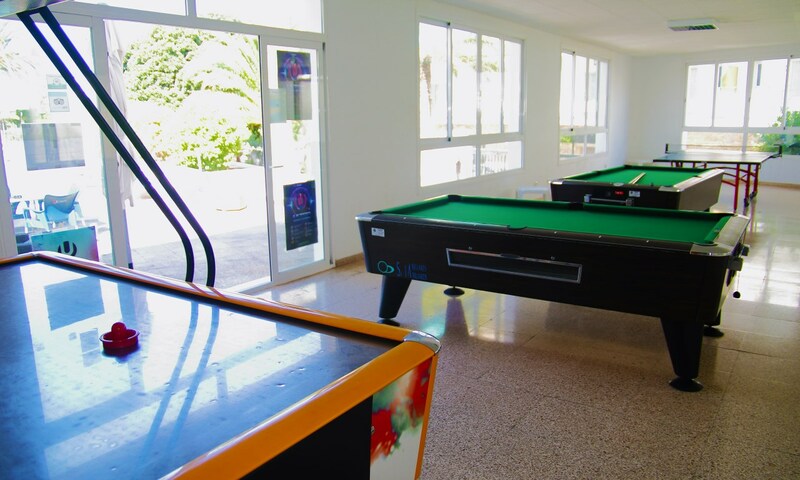 We understand the motivation of many of the customers who visit us when they come to Ibiza to enjoy the wide range of activities offered, but this cannot justify in any way being disrespectful to other guests and staff or damaging the hotel facilities. Inappropriate behavior, playing music in the rooms late at night, parties in the rooms, etc... will not be accepted. In the event that this behavior does not change after various warnings, the hotel reserves the right to evict you from the hotel premises for the rest of your stay. Can I bring to the hotel pool my own drinks and/or food? Hotel guests can eat in their rooms food and beverage acquired both inside and outside the premises. However, we inform that the hotel policy does not allow the consumption of any drinks or food in the hotel common areas that has not been purchased within the hotel premises itself. I forgot something in the hotel room. Can you send it to me? We know that often the rush or excitement after a magical holiday in Ibiza can leave behind objects or clothes forgotten in the hotel room. You can send us an email to check if we found your forgotten item in our lost and found department. If so, will be happy to send it back to you. In that case we would need you to send us your full address by mail and we will organize a courier delivery. For international shipments the courier companies do not accept the “payment on delivery” option, meaning we will need your credit card details too to charge the shipping expenses. Can I print my boarding passes in the hotel? The hotel has computers with internet access and printer in the lounge where you can print both boarding passes and reservation confirmations for your online purchases. The closest beach is Caló d'es Moro which is 300 meters away from the hotel, 5 minutes walk. Within the same distance you can find the Arenal beach next to the port of San Antonio. Only 1.3 km away is, in our opinion, the best coves that can be reached by foot: Cala Gració and Cala Gracioneta. Our reception staff will be happy to give directions to other beaches on the island accessible either by car, bus or boat. How far is the hotel to the bus station in San Antonio? San Antonio Bus Station is just 5 minutes away from the hotel by foot (400 m. Approximately). From there you can get to Ibiza town, Santa Eulalia and Playa d'en Bossa (Bora Bora) and others as well as some of the most famous beaches of Ibiza such as Cala Bassa, Cala Conta and Cala Tarida. Are there restaurants, supermarkets, bars, etc ... near the hotel? Our hotel is located in the heart of San Antonio, surrounded by everything you need so that you don´t miss anything on your holidays. At the hotel corner you will find several ATMs and next to it several shops and supermarkets. The food options around the hotel are very varied, restaurants with local and international cuisine, Asian, Mexican, fast food and many more to satisfy all the tastes. Just 150 meters away from the Tropical you will find the Ibiza Rocks where you can attend their famous weekly live music concerts. 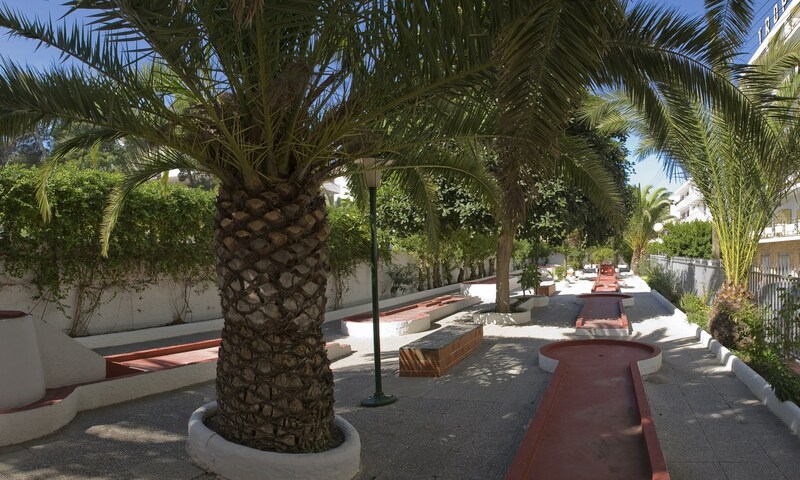 San Antonio West End is also very close where many people gathers to enjoy the Ibiza nightlife. The Sunset area is a must (Mambo, Cafe del Mar, Savannah and many more), just 10 minutes walk away from the hotel, with its famous terraces facing the sea from where you can watch the famous Ibiza Sunset listening to the greatest house music hits and chill out tunes. 1. Take bus line number 9 from the airport to San Antonio (have to get off at the last stop, San Antonio Bus Station which is just 5 minutes walk away from the hotel). The approximate cost is 4.50 € per passenger and schedules are available on www.ibizabus.com . If this line was not working on the dates you visit Ibiza, you can always take bus number 10 from the airport to Ibiza and then bus 3 from Ibiza to San Antonio.